as i've said previously, i've had to cut out dairy and fatty meats due to the operation. i originally thought that i would really struggle with this in the kitchen, but so far, it hasn't been a problem. the only glitch has been that my iron and blood pressure has remained pretty low since the surgery and, since a nice hanger steak is out of the question, i've been forced to find adequate substitutes. and since i don't fancy myself pop-eye with the raw spinach situation, last night i set out to prepare a meal high in iron AND taste. one can only drink so much green juice, am i right? luckily for me, fresh tuna is very high in iron and protein. (and mercury levels, i know. i know.) i added even more iron with a greek white bean panzanella salad on the side. 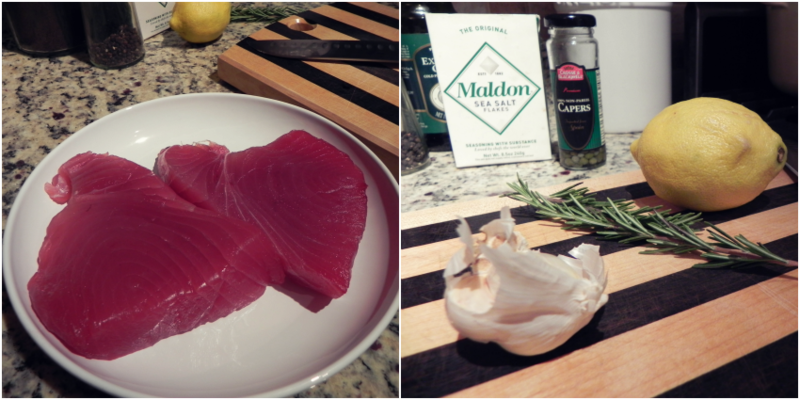 and, i mean, can we talk about how gorgeous those tuna steaks are? my personal grocery shopper, joe, did an excellent job picking those babies out. a-plus, babe. a-plus. here's the recipe if you're interested.... dairy and meat-free. for the marinade, combine all of the ingredients and mix. 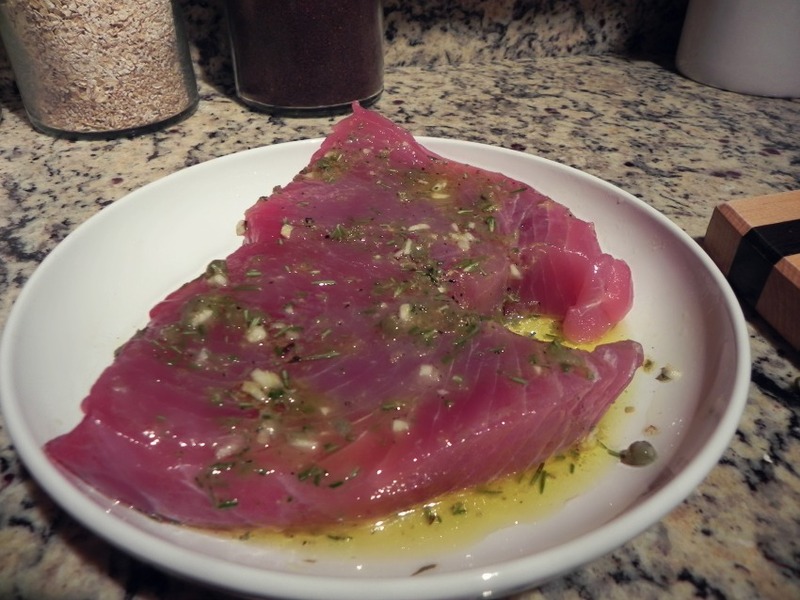 pour over tuna steaks and let marinate for one hour or so in the refrigerator. 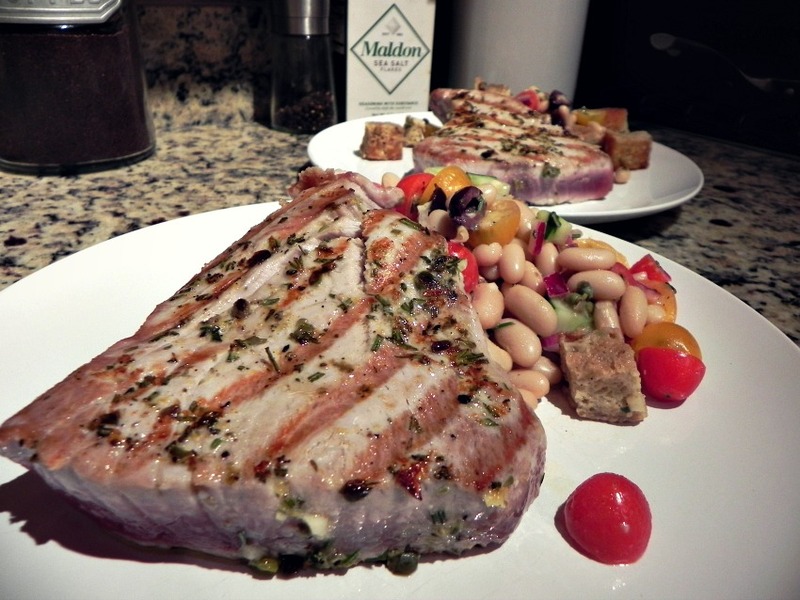 when ready to serve, grill the tuna steaks. for medium rare, grill the steaks for three minutes on one side, two minutes on the other. cook less or more according to your preference. i served the steaks alongside a white bean panzanella salad which consisted of drained and rinsed white beans, grilled ciabatta croutons, halved yellow and red grape tomatoes, diced red onions, seeded diced english cucumber, halved kalamata olives, capers, chopped rosemary, and a dijon-red wine vinaigrette.